Announcement Cat, Cat Print, Cat Calendar, Cat Jewelry, Orange Cat, Cat Painting, Cat Drawing, Cat Art, Cat Gift, Cat Card, all of these are available in my shop. Plus FREE SHIPPING for prints on all US orders! Come in and enjoy my shop of colorful and lively cats, filled with character and personality. Most are done with watercolor and ink, but acrylic may be added in some cases. My quality prints are 5"x7", on Epson Matte Heavyweight photo paper and presented in an off-white mat, ready to be inserted into any 8"x10" frame and hung on your walls. I offer FREE SHIPPING on all prints shipped to a US address! I accept Paypal and credit cards. Please see my shop policies page for details. Please visit my Shop Policies page for details. All images are copyrighted and may not be reproduced without written permission. Cat, Cat Print, Cat Calendar, Cat Jewelry, Orange Cat, Cat Painting, Cat Drawing, Cat Art, Cat Gift, Cat Card, all of these are available in my shop. Plus FREE SHIPPING for prints on all US orders! 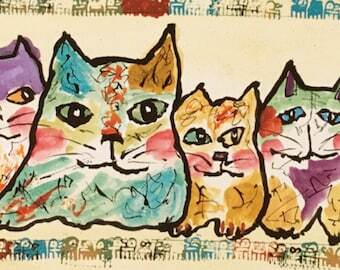 Welcome to my world of colorful and expressive cat art! 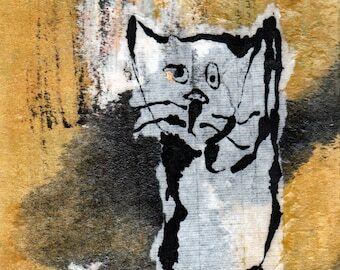 I hope you will find that special cat right here in my shop. If not, please return often as I am adding new items on a regular basis and one of these days I will have just what you are looking for.